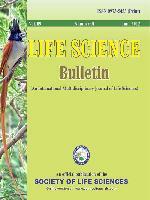 At least one author (in a group of 2 co-authors only) must be subscriber/member of the Life Science Bulletin at the time of submission of the manuscript. Manuscript will be accepted only after proper reviewing and on the advice of the editor(s). The management committee/editorial board assumes no responsibility for the statement and opinions advanced by the author(s). Submission of research paper implies that it has not been previously published and it is not under consideration for publication elsewhere. Galley proof will not ordinarily be sent to the author(s), unless desired. Therefore author(s) is/are advised to prepare the manuscript with utmost care and strictly as per format of the journal. There will be no printing charges but nominal price of twenty-five reprints is compulsory after the receipt of invoice/acceptance letter. The management does not accept responsibility for any type of damage or loss of manuscript; keep a copy for your record. Pandey, B. N.; Singh, Shivesh Pratap and Singh, Rashmi (2010). Sustainable Management and Conservation of Biodiversity. Tandon, Richa; Singh, Rashmi; Dwivedi, V. K. and Tiwari, G. L. (2010). In : Sustainable Management and Conservation of Biodiversity (eds. Pandey, B. N.; Singh, S. P. and Singh, Rashmi). Narendra Pub. House Delhi, pp. 1-24. Chandra, K.; Khan, Salma; Gupta, Devanshu and Singh, Shivesh Pratap (2011). Natl. J. Life Sci., 8(1) : 67-70. Manuscript in duplicate, one original and the Xerox should be submitted with a hard copy on CD-Rom of the text to Dr. Shivesh Pratap Singh, Chief editor on the editorial office. The soft copy can be sent directly by email as an attachment in PageMaker/word at editorlsb@yahoo.in.